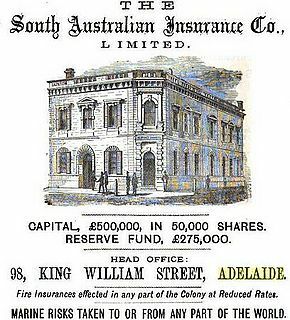 Co-ordinates 34.9° S., 138.5° E.
Adelaide is the capital city of South Australia. The layout of the city was designed by Colonel William Light, the colony's original surveyor. Adelaide's central district is surrounded by a ring of park lands and is divided by the Torrens River. It was named after the Queen consort of the British king, William IV. It is the only state capital to have been founded using free settlers - there were no convicts. The city has a population of over a million people, two-thirds of the state population. It is situated on the plains between Gulf Saint Vincent on the west and the Adelaide Hills, part of the Mount Lofty Ranges, on the east. The result is an urban area that is barely 20 km wide, but almost 100 km from Gawler in the north to Sellicks Beach in the south. Adelaide was the first colonial settlement in the new colony of South Australia in 1836. Before that, the area was occupied by the Kaurna Aborigines. The major sights in the city include the Everidge Centre of Aboriginal Arts and Crafts, the Museum of Contemporary Art and the Wilkinson Maritime Park. The Adelaide Cricket Ground is renowned as one of the most beautiful in the world, it is currently being redevloped however, and may lose some of its charm. Adelaide is known as the City of Light and the City of Churches. It is also known as the Festival City, and holds the largest Fringe Festival in the Southern Hemisphere. The Adelaide Fringe Festival was started to contrast the Adelaide Festival of Arts, but has grown to become much more popular. The city of Adelaide also contains a variety of higher education institutions, including the University of Adelaide, established in 1874. Bushfires are a relatively common occurrence in the regions surrounding Adelaide, with large bush fires generally occurring every 3 to 5 years. This page was last modified on 26 September 2018, at 08:04.